This page is dedicated to some our past details, to give you an idea of the processes, time, and materials that go into our details. From basic paint restoration and enhancement, to "New Vehicle Prep", Interior Restoration, and even NECK-SNAPPING CAR SHOW WINNERS!!! The proof is in the pictures!! Thanks for stopping by, we hope you enjoy the info and pictures! This van was brought in nearly new, with only 868 Miles, and has never seen a brush car wash (since owner picked it up new). It came with a healthy amount of dealer installed swirl marks due to improper care BEFORE delivery to customer even! Thats where we come into the picture!! To fix what the dealer messed up. After a proper hand washing... we got going on the paint correction. While not a FULL show car correction, we still put in nearly 10 hours of polishing to get out the swirls and minor scratches pre-applied to this van. Once we got the paint to a much more acceptable level, we started on the Paint Protection Film. This customer was very picky, and wanted just about ALL the major areas covered with LLumars Platinum Paint Protection Film... so we got to work! Hood, fenders, bumper, headlights, mirrors, charging plug door, door bottoms, rocker panels, a-pillar, roof, even inside the door sills!! This will help keep this new van from getting stone chips, scuffs, and sandblasted paint while the family is on vacation cross country, or just running across town! After all the PPF was dried and looking seamless... We started to apply our highest level Ceramic Coating from SYSTEM X... DIAMOND SS!!! This is the smoothest, shiniest coating you'll ever see! Simply put, it drips gloss!! While it's not a vehicle for car shows, this will turn heads for sure!! We didn't stop with that... we applied our PRO ceramic to all the satin finish trim, and inside all the door jambs too, to aid in future cleanings. The wheels got coated in Diamond SS as well. Lastly, ALL the glass, including the HUGE Panoramic Glass Roof, got 2 coats of our SystemX Glass Ceramic coating as well!! Making visibility amazing, and keep our customers and their families safer while driving. Our SYSTEM X Ceramic Coatings will keep the paint looking shiny and keep it protected for YEARS!! (not months, like typical waxes). And since we are a certified installer for SystemX, this customer has a lifetime guarantee that it's protected!! We even cleaned, vacuumed, and UV Protected the interior for them, so they are ready to go, inside and out. We're looking forward to this one coming back next month for our Premium LLumar Window Tint as well!! Thanks again Jon & Sarah!! This beautiful GT500 Cobra Mustang came to us with a few issues... Even though it has low miles, the first owner's choice of wash mitts must've been similar to a scouring pad... the paint had a LOT of swirl marks in it! Second, it needed TINT!!! BAD!! We started off with a full decontamination wash, including full clay bar services, and made sure to get the wheels extra good with all that brake dust buildup. While only scheduled for a 2 stage Paint Enhancement Service, once we got the vehicle cleaned up and did a few test spots, we quickly realized we needed a little more in some areas! After taping off plastics & trim, We started most of the vehicle with Megs MF Pads to cut the heavy swirls and scratches, then followed up with an Lake Country CCS Pad, and finished it off with a LC CCS White Pad, and CarPro Essence finishing polish. We'd say we removed nearly 100% of swirls & scuffs and a solid 80%-85%+ of remaining minor scratches. After it was all shined up, we started adding the LLumar Premium Ceramic Film, in 35%, all around the vehicle. The owner will now stay as cool as he looks! To finish it off, we topped the entire vehicle with 2 layers of our SystemX Crystal-SS Ceramic Coating for that ultra smooth & shiny finish!! Protecting and adding gloss for YEARS! Finally, we decided on our DIAMOND-SS for the wheels, for even more added protection to the more extreme environment these wheels are accustomed to! Thanks again Mike for the chance to work on these beautiful black GT500 for you! The owner of this sweet little Cobra Replica brought it to us for some custom hood graphics, but we ended up talking about the paint condition as well. In the end, we needed to make this car show-worthy again! The paint was dull, swirled, scratched, and had ZERO ‘POP’ to it anymore! We needed a very safe approach, as the paint was obviously old and showing signs of wear. We took a safe approach with Griots Fast Correcting Cream on a yellow Lake Country CCS Pad, followed by Griot Perfecting Cream on a Lake Country White CCS Pad. After about 6-7 hours of polishing, we felt pretty good about the new paint condition!! Make a HUGE difference. The black had some great reflections again!! We removed approx 95% of the swirls, and probably 75% of the minor scratches! Once finished with the paint, we also used some Opti Metal Polish on the wheels to shine up that chrome lip as well! Once it was all prepped, we doused it in TWO LAYERS of our Crystal SS (SuperSlick) Ceramic Coating!! That added some great depth to the paint, but now it’s protected for YEARS!! No need to wax it before every show. It will be glossy and protected from UV Rays for a LONG time now!! Customer was super happy, and we hope to see his Mustang in the spring too! In case your wondering, it looked like a built 351 Windsor under the hood… and it sounded AMAZING!!! This sweet custom built GTO owner came to us for a little protection on his pride and joy!! Originally wanting some PPF protection on the front end, we ended up changing gears and decided what this show stopper needed was a little TLC in the paint department. while the paint is still fairly new, constant washing to keep it clean left some swirls in the paint, and somehow water marks on the wheels. After a full decontamination wash & clay bar process, we started with a safe approach using Griots BOSS Fast Correcting Cream on all the upper visible surfaces, then finished with Griots BOSS Perfecting Cream on a Lake Country White CCS pad for that final shine. The chrome wheels got some Opti Metal Polish on a 3" LC Orange pad to get rid of the water marks. For protection, we topped it with our Super Slick Crystal SS Ceramic Coating from SystemX / Element 119!! For YEARS of glossy protection and ease of washing!! The chrome wheels got a treatment of SystemX PRO-9H coating as well, to keep them shiny as well! Customer was very pleased when he picked it up... and we were excited to work on it!! Thanks again Blake for trusting us on this one!! We are looking forward to what you'll bring us next year from your families collection!! We had quite the job this week on this 2016 Camaro SS. Customer was looking to remove some of the crummy factory PPF (Paint Protection Film) and apply something that would actually work, in areas that it actually needed to be applied to! We started by removing the old PPF, then moved to a full wash and decontamination. We opted for our 2 stage Paint Enhancement Polishing Package as the customer took relatively good care of this car already, but with this soft GM Metallic Black paint, it needed more than just something basic to get rid of the swirls and minor scratches. But we didn't stop there... we then applied our Element 119 / SystemX DIAMOND SS Ceramic Coating to the entire vehicle, even over the PPF (once dried, of course). We then followed up with SystemX PRO 9H ceramic on the wheels as well. Finished off with some Griots Glass Sealant, and VRP on the rubber for that shiny look... Customer couldn't have been more pleased!!! Too bad the weather was so bad when he picked it up, our pictures just don't do it justice! Thanks again Randy for trusting us with your favorite car, we look forward to working with you again!! This sweet 1969 Chevelle 396 SS Convertible came to us needing some major attention. COVERED in hard water stains, spots, swirls and scratches, we knew we had our work cut out for us. Even those shiny bumpers and classic wheels were dull as could be with all the mineral deposits on them. Normal washing wasn’t going to remove any of those! Knowing this car has a few layers of paint on it from over the years; our typical method of paint metering wasn’t going to work. So we chose a little safer route this time, giving the paint our full PAINT ENHANCEMENT treatment, which consisted of only a mildly aggressive cutting process, with Griots BOSS Fast Cutting Cream and a Megs MF Cutting Pad. To really bring out the shine, we moved over to Griots BOSS Perfecting Cream on a Lake Country white CCS pad for the final polishing process. We were able to SAFELY remove an estimated 90%+ of the swirls, and even a good amount of the scratches that were on the paint. More importantly, we cannot find one single water mark left! Once the paint was shiny red again, and no longer swirled and dull… We gave it a solid 5-6+ years of protection with our SystemX PRO Ceramic coating. Customer even asked us to polish up those sweet aluminum mag wheels, which we also gave a good coating of SystemX PRO when completed. We really enjoy working on these classics, and enjoy showing off our work even more. Every show car we’ve done this summer has placed FIRST at its next show… we hope our streak continues here if he takes this gorgeous red Chevelle SS to any fall shows! This beautiful Air Natique wake boarding boat was brought in by a good customer of ours, for a little refreshing. It was getting oxidized, the decals were a little beat up, and the seats hadn't been properly cleaned and protected in a while. We started by removing the old decals, then a 2 stage polish on the hull and over the rails with some of our go-to Marine/Rv products. After the gelcoat was brought back to life and nice and shiny... we applied new Air Natique decals to make it look new again! But we didn't stop there... we then applied our Element 119 / SystemX XTREME Ceramic Coating to this boat for YEARS of protection!! All over the sides, up and over the rails, and on misc interior parts as well. Whatever we couldn't quite coat with Extreme inside the boat, was then polished and waxed as well. The glass was polished with CarPro CeriGlass to really clean it up and make it crystal clear out on the lakes!! The seats where scrubbed clean, and coated with our SystemX Interior Hydrophobic and UV Protectant. Lastly, what would a clean boat be without a clean trailer... so we polished/waxed the trailer frame, cleaned the wheels, and dressed the trailer tires too! Now she's ready to turn heads again out on the lake! A good customer of our brought us his toy project... he bought it stock a few years ago, and has built to the rockin' red Jeep you see here!! This winter... the LS6 swap goes in too!! But since it's a driver, he bought it to us polish out the swirls, and give it some good protection with our Element 119 DIAMOND Ceramic Coating! This Jeep got our Paint Enhancement Package, which starte started with some Griots BOSS Fast Correcting cream on a Megs MF Pad, then moved up to some Griots BOSS Perfecting Cream on a LC White CCS Pad, which provided a great surface for us to ceramic coat. But we didn't stop there!! We cleaned out all the door jambs and sealed them too. We went ahead and prepped the wheels, all five, and ceramic coated those as well. The step rails and both bumpers got ceramic as well! The door handles and mirrors got restored with Gtechniq C4 restorer and coating. To top it off, we doubled up on the VRP for all five wheels to keep them nice and glossy at the customers request!! Snapping necks won't be a problem now!! This glows in the sun, and the gloss will look wet for years to come!! This GORGEOUS 2010 ISF was previously paint corrected and polished last year, along with Cquartz Ceramic. So this year, we did a simple 1-stage polish with CarPro Essence to remove any oxidation and minor swirls induced since last spring, and topped it with TWO LAYERS of CarPro GLISS, a super hydrophobic Gloss Enhancing coating! We couldn't be happier!! One of our head detailers brought his MDX in and we got to work on ceramic coating it. We had previously done a 2 stage basic paint enhancement on it, so we were able to get by with a single step polish this time using Griots Perfecting Cream and some Lake Country White CCS Pads. Then we coated in our new Element 119/SystemX DIAMOND Ceramic Coating!! Needless to say, the pictures speak for themselves! It turned out gorgeous! The paint is a deep, rich black, the metallic pops, and the gloss is insane!! Already had it's first wash, and the water beading is more than impressive!! Can't wait for our next project with this coating... Stay tuned for more to follow! After showing this previous customer how nice our latest vehicle coated with Element 119 Diamond Ceramic Coating is... he couldn't wait to schedule his wifes Ram PowerWagon and his personal vehicle as well. Well, ladies first! A thorough wash & decontamination, then a quick polish on this nearly NEW beautiful red ram and it was ready for our Element 119 SystemX DIAMOND Ceramic Coating. Being able to offer 10+ Years of guaranteed gloss and beading perfection is just one of the benefits of our Diamond coating. To finish it off, we coated all the fender flares, bumpers, and grill too! Some dressing in the fender wheels, tires, and of course some sealant on the wheels topped off this beauty! Now he's just anxious to get his new vehicle on the schedule as well! Thanks again 'Ski!! This past week we had the opportunity to work on this GORGEOUS Subaru STi S204 Replica! Full air ride, lots of authentic S204 pieces both inside and out... and a lot of Carbon Fiber accents! After a quick wash & complete chemical decontamination, we proceeded with our Two-Stage Paint Enhancement Package. Using Griots Fast Correcting Cream paired with a Megs MF Cutting Pad, swirls and minor scratches are no more! We followed with Griots Perfecting Cream and Lake Countries new Hydro-Tech Cyan polishing pad, leaving us with a deep, reflective finish. EVERYTHING got a layer of Gtechniq C1 ceramic coating, for some amazing protection and shine. But the kicker here is the 2nd layer of ceramic, the Gtech EXO made this paint appear to be dripping with gloss!! Every show car needs clean wheels... so up on the lift it went, wheels removed, fully decontaminated and cleaned!! Then coated with cQuartz Ceramic to make them even shinier & super easy to clean. While we were at it... we cleaned the calipers and coated them with Gtech C5 as well! This entire wash process should be a breeze from here on! Lastly, we made sure to topcoat it all with C2v3, including the door jambs, and even all the interior Carbon Fiber Pieces!! While we did NOT do anything inside, we felt obliged to include a few interior pictures of those STi Recaro seats straight from Japan, overnight! If you see this badass STi at the car show this weekend in the Wisconsin Dells... put on your sunglasses, that metallic paint may just hurt your eyes! As a gift for his wife’s 40th Birthday, our customer bought her a 40th Anniversary Edition Mustang Convertible with a Rousch Package, and brought it to us first for some detailing, tint, and graphics, before surprising her this weekend. The paint was in a bad state of neglect with lots of swirls, and not much shine! Not only did we complete a 2-stage polishing process, removed a lot of the swirls, all the oxidation, we made it SHINE again! We restored the trim back to a satin black with our trim dye that will last years. Also on the list was shining up those chrome wheels, dressing the tires, then protecting the paint with a quality sealant and gloss enhancer! We also restored the worn, faded, peeling headlights to a like-new look, and slightly tinted the taillights too. We also redid the factory stripes in a Matte Charcoal Metallic, and added the door stripes, and finished it off with a rear valance wrap and the ROUSCH insignia! At the end, we tinted all the windows as well. She should be one happy girl this summer with the top down cruising in her shiny Rousch Mustang! Customer brought in his Forester the other day for some TLC both inside and out. He bought it new nearly 8 years ago... and had completely forgotten it had a METALLIC black paintjob!! I think he was happy AND surprised to be reminded of that! We were shocked when we figured it out after a little polishing. The interior was full of salt stains and half the gravel from WI State Parks. But as an avid rock climber, this customer gets his use out of that car traveling nearly every weekend to climbing events! So it was no surprise this Subaru has been put through it's paces After cleaning the inside, we fully washed, decontaminated, and clayed the paint and glass. Using Mequiars Paint Reconditioning Cream and Lake Country CCS Pads for SINGLE STAGE POLISH, we were able to remove a LOT of the swirls, all of the oxidation, and even some scratches from this paint... leaving a smooth, deep, shiny METALLIC black finish once again!! Protecting it with Megs Synthetic wax will make it easier to wash all summer long! Customer brought us his 4 year old Challenger R/T Redline Edition. He previously removed the Redline graphics package to clean it up a little... but he wanted it polished and protected!! Even though it has less than 4,000 miles on it... we gave it some love with the polisher, making sure to get all the lines and tight spots extra good! After shining it all up to near perfection, we coated it with some Gtechniq Crystal Serum Light for amazing gloss and protection for years to come! Then finished with C2v3 on all the painted surfaces and door jambs too. We didn't forget the wheels or wheel wells. We cleaned them up, sealed the wheels, and dressed all the wheel well plastic. Customer wanted glossy tires, so glossy tires is what he got!! If you see or HEAR this Hemi roaming around town... look out!! Don't be blinded by the shine! Rumor has it this nearly NEW (22k miles) Escalade was used in last falls deer hunting operation. Judging by the amount of dried blood we found in the back, we can only assume they hauled it home inside as well! At least... we hope it was a dead deer they hauled in there! Those seats took a LOT of TLC to get cleaned, but they look nearly new now. Yes, it was mostly splotchy blood all over them. Presumably transfer from their blaze orange suits! Deer blood stank it up pretty bad, after thoroughly scrubbing all the carpet, then extracting ALL the carpets... and running the Ozone Machine.... the smell was finally gone. Oh yeah, we got a few cig burns fixed up too, on the driver door & carpet too! Hopefully they buy a truck next fall. This 14 year old Black Cadillac CTS-V has had it’s share of fun, and improper washes too! One our customers brought us his new toy for a little paint enhancement and protection. Being 14 years old, and nearly 100K on the clock, the paint was in pretty rough shape! (check out the last few pics) As usual we had to pay extra attention to detail on this one. Wash, Decon, 2 correction stages of polishing, and 2 finishing stages, a total of over 15 hours of polishing. Even a little wet sanding for some minor headlight resto. Then we coated it with GTECHNIQ Crystal Serum Light, topped with C2v3 to provide years of protection. We also restored all the trim to a brilliant black again with some G-Tech C4. Then finished by sealing the glass! During the whole process extra time was spent with a specialized light that mimics sunlight, showing any remaining imperfections, allowing us to correct as many as possible. 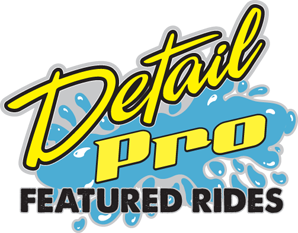 This extra attention to detail is what we pride ourselves on here at Detail Pro. Griots Garage Fast Correcting Cream Griots Garage Perfecting Cream Megs MF Cutting Lake Country CCS White Pads Lake Country CCS Black Finishing pads, Eagle Edgeless Towels all day long! Gtechniq Crystal Serum Light, Gtechniq C4 Trim Restorer, Gtechniq C2v3, Griots Garage Glass Sealant, Adams VRP on the rubber and wheel wells. Stay tuned for the next project! Our customer trusted us with their brand new blacked out 4Runner, to polish away the swirls from the first (and only) dealership wash! After carefully removing the swirls, we protected it for years to come with CSL Ceramic Coating! We didn't stop there, we coated all the trim and plastics and put C1 ceramic on the satin black wheels as well. We even applied some PPF in the door jambs to keep scuffs to a minimum. A little C2v3 on top of the ceramic added a great gloss to the already extremely shiny paint. To finish it off... we used Megs Hyper Dressing on the wheels and wheel wells at the customers request... for that deep black tire look, that won't sling product onto that beautiful metallic black paint! Product List: Lake Country CCS Pads Griots Perfecting Cream CSL & C1 Ceramic Coating C2v3 Megs Hyper Dressing Lots of attention to detail!